SYDNEY, Australia — Atlassian is a very boring software company. It develops products for software engineers and project managers, with hits like Jira (for software project management and bug tracking) and Fisheye (a revision-control browser). And who could forget Confluence (an enterprise knowledge management system)? So why are its two founders household names in Australia? Because Scott Farquhar and Mike Cannon-Brookes, both 39, are the country’s first start-up-to-I.P.O. tech billionaires. And because in the last year, they have started to make noise. Until recently, they largely stayed out of the public eye, even as Atlassian grew to become a $20 billion company. Now, as Australian politics tilt toward the right on global issues like immigration, cybersecurity and climate change, they are emerging as new political voices, getting in Twitter spats and lobbying Parliament. The other reason they are now household names: In 2017, Mr. Farquhar bought the most expensive home in Australia, a historic Sydney estate that sold for 73 million Australian dollars, or $52 million. In December, Mr. Cannon-Brookes broke that record when he closed on the house next door. 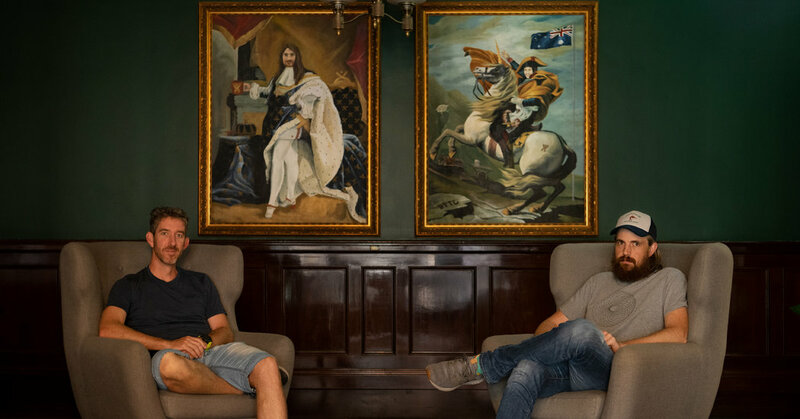 I met the Atlassian founders for a few days in Sydney. Over brunches, a ferry ride and a birthday party, they told me about their new roles in public life, and what it feels like to be the first tech billionaires in a country where wealth usually comes from mining or banking. The two met as undergraduates at the University of New South Wales, where both were in a business scholarship program sponsored by Australian companies. They were encouraged to join one of those companies after graduating, but instead the two friends founded Atlassian, shocking their teachers and friends. It was 2002. Doing a start-up was unusual. “It was disbelief, really — why would you not go with a sponsor company?” said Christine Van Toorn, the program’s director and a lecturer at the school. They relied on credit cards for initial financing. They advertised by going to developer meetups, buying beer for the room and putting Atlassian stickers on the bottles. The company took off almost immediately. “Within three years we went from pariah to sponsoring the program ourselves,” Mr. Farquhar said. The products they created were cheap and easy to use. They sold by word of mouth (the company employs few sales representatives). But Silicon Valley paid them little mind. When their friend Didier Elzinga, founder of Culture Amp, was at a venture capital dinner in Palo Alto, Calif., an investor asked why people should care about Atlassian. First they confused Silicon Valley. And then they confused Australia. Their approach to policy is an extension of how they run a business together and live next door to each other: by relying on their differences. Mr. Cannon-Brookes’s father was the chief executive of Citigroup Australia. His son wears his hair long, usually under a trucker hat. He has a shaggy beard and swears casually. Mr. Farquhar’s roots are more working class: His father worked at a service station, and his mother worked at McDonald’s. He is quieter, with close-cropped, sandy brown hair. He was recently upset that he hadn’t finished a marathon in under four hours (it was four hours and two minutes). When his green smoothie almost overflowed its glass (but didn’t), Mr. Farquhar immediately thought of lenses: “Positive meniscus!” he exclaimed. In their political activism, Mr. Cannon-Brookes is often the public face, posting on Twitter and talking to the news media, while Mr. Farquhar focuses on Canberra, the capital — where this week he caused a stir by condemning a new law under which tech companies can be forced to build tools that help law enforcement get around encryption in their products. “Sometimes we try the front door, sometimes we need to blow up the side door,” Mr. Cannon-Brookes said of their political activities. Both became more interested in Australian politics after policies took a sharp turn toward the parochial, with the governing coalition abandoning efforts to address climate change and stoking fears around immigration. That presented a problem for a company that needs to hire talented engineers, often from abroad. And so initially, the founders’ main goal was basic: to make Australia more tech-friendly and its politicians more tech-aware. First, they hosted a coding class for elected officials and started working to get engineering into more curriculums. “It was like organizing the world’s worst wedding,” Mr. Cannon-Brookes said. Australia just passed Switzerland as the richest country in the world as measured by household median wealth, and Mr. Cannon-Brookes thinks its reliance on mineral wealth has made the country slower to make tech investment or long-term economic change a priority. Mr. Cannon-Brookes is especially passionate about climate change. As Prime Minister Scott Morrison has walked back Australia’s renewable energy ambitions, Mr. Cannon-Brookes has become a staunch critic. “You’ve made me mad & inspired me,” he told the prime minister on Twitter, adding an expletive for emphasis. “His knitting is running the country well, and he doesn’t seem to be doing it,” Mr. Cannon-Brookes said. He personally invests in alternative fuel and food sources, and he is especially interested in controlled-environment agriculture. “My wife and I have a big belief in the future of insects as a food source,” Mr. Cannon-Brookes said over brunch (granola, not insects). Mr. Farquhar tends to focus on the issues aligned with Atlassian’s fortunes: cybersecurity (he says the new encryption law has cost the company customers) and immigration (he argues that the government is hurting recruitment and innovation by aiming to cut Australia’s immigration intake). It is not at all clear whether he can influence the encryption law; potential amendments are due to be debated in Parliament this week, and no changes are expected. But on immigration, Atlassian’s founders have moved the needle. After Australia’s skilled worker program cut several technology roles (including web developer) from its approved visa categories, Mr. Farquhar and Mr. Cannon-Brookes lobbied Parliament to change course and add more opportunities for international recruitment. On a ferry ride to work, Mr. Farquhar pointed out the two founders’ houses, massive estates set into the lush Sydney hillside. Before they bought the properties, plans had been made to tear down the houses and develop the lots. Mr. Cannon-Brookes and his family moved in a few weeks ago. He and Mr. Farquhar created a hole in the fence so their children could play together. One day a week, the founders pick up their children at school together and take the ferry home. It was a symbolically significant transition. The Fairfax family, a newspaper dynasty, had owned the properties since 1901. This is a big change for Australia, where software entrepreneurs do not have the kind of cultural sway they have in the United States and elsewhere. Money notwithstanding, running a growing tech company in Australia is a challenge, the founders said. Recruitment is hard. Two-thirds of Atlassian’s work force is in San Francisco. The founders have formed a cohort of friends with big tech companies outside Silicon Valley, including Daniel Ek, the Swedish chief executive of Spotify, and Ryan Smith of Qualtrics, who is based in Utah. “We’ve got all the same problems,” Mr. Cannon-Brookes said. It is one of many reasons the two men say they would not leave Australia for Silicon Valley.